Established in 1984, Telrepco is a woman-owned business providing rugged mobile computing solutions and services. Our goal is to save you money while minimizing your down time. We are more than your average reseller because we are also an Authorized Panasonic TOUGHBOOK Repair center, capable of fulfilling all of your in-warranty and out-of-warranty repair needs. At Telrepco, our goal isn't just to sell you a product, but to provide you with a solution. We pride ourselves on developing lasting relationships with our customers and providing the kind of individual support you won't get anywhere else. If you need help deciding what equipment is best suited to your needs, call us toll free at 1-800-537-0509 and our knowledgeable sales team will be happy to assist you. Working within a budget while still getting the rugged technology you require can be a nightmare! We make it easier by offering many models of refurbished Panasonic TOUGHBOOKS that are in like-new condition for substantially lower prices, in addition to the full line of new Panasonic TOUGHBOOK mobile computers. Each TOUGHBOOK is refurbished in-house by experienced technicians, allowing us to carefully control the quality of the refurbishment process. 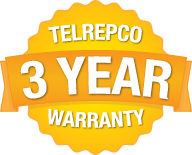 Every Panasonic TOUGHBOOK refurbished by Telrepco comes with a minimum (1) one year warranty with the option of extending your warranty to up to (3) three years, ensuring you get the support you need from a company you can trust. Many of our new products are also available on CT and NJ NASPO contracts. Contact us or visit our Government Contracts page for more information.